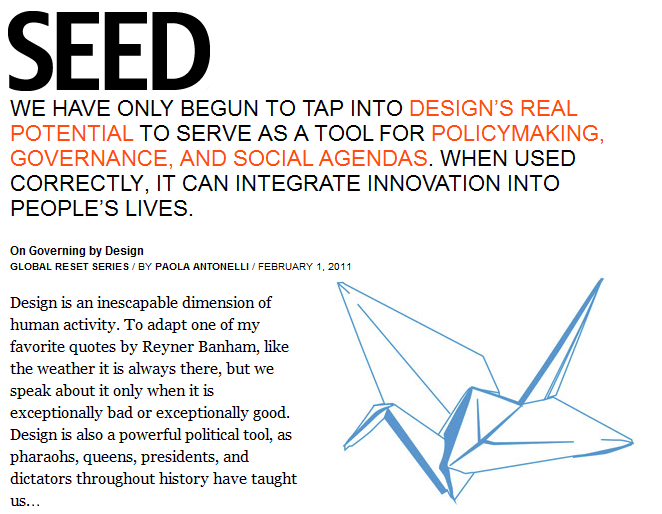 A recent article by Paola Antonelli, senior curator of Design and Architecture at the Museum of Modern Art, published in SEED Magazine's Global Reset Series discusses the potential for design to help global leaders address the pressing economic, social, and environmental challenges of our day. Antonelli informs us on the relationship of design, democracy, and governance and identifies emerging fields of design that will provide new insight and innovations for decades to come. She also points out which countries 'get it' and which still lag behind in optimizing design's value to improving the human condition, as well the economy.